Hello SHESS members and supporters!!! We just wanted to let you know that the Society of Hispanic Engineers and Science Students (SHESS) & the Hispanic Business Society (HBS) at Cal State LA will be hosting the B.E.S.T. 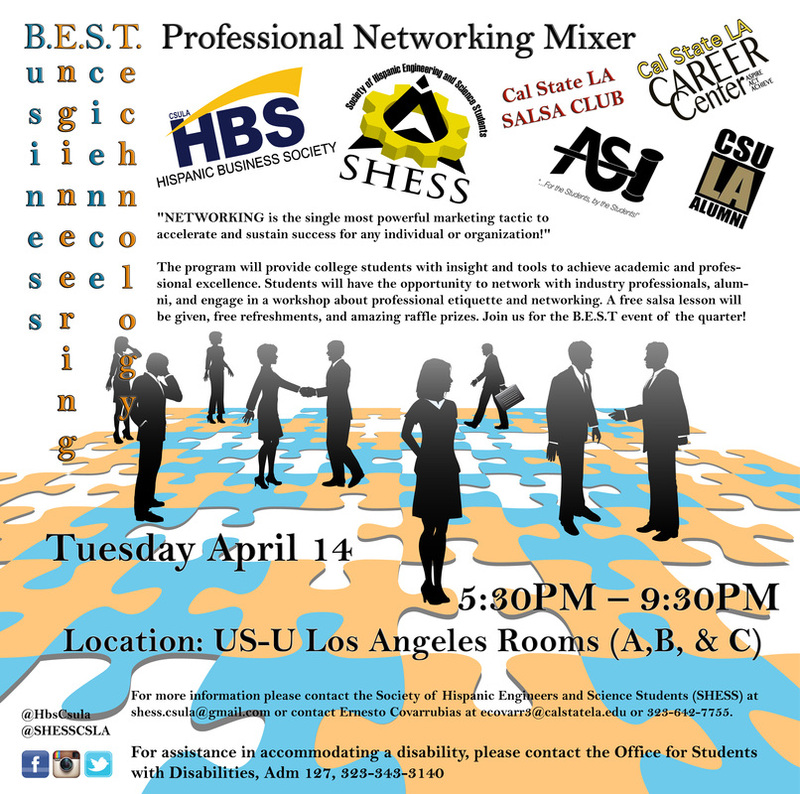 (Business, Engineering, Science & Technology) Professional Networking Mixer on Tuesday April 14th, 2015 from 5:30PM - 9:30PM. The program will provide college students with insight and tools to achieve academic and professional excellence. We will be offering an interactive workshop that will address appropriate etiquette and networking skills in a professional environment with real industry professionals. "NETWORKING is the single most powerful marketing tactic to accelerate and sustain success for any individual or organization!" To succeed you must continually connect with new people, cultivate emerging relationships and leverage your network. Throughout the mixer, Cal State LA students will have the opportunity to network with industry professionals and alumni. There will also be periodic drawings with lots of great raffle prizes! Limited drink tickets will be distributed for those who register online. First Come First Serve! Hors-d'oeuvres and refreshments will be provided. Should you have any questions, do not hesitate to email the SHESS organization at shess.csula@gmail.com or contact Ernesto Covarrubias (SHESS) at ecovarr3@calstatela.edu or 323-642-7755. Thank you for your time and we look forward to seeing you soon. Hello SHESS/ SHPE CSULA members and supporters! We invite you to join us for our yearly summer bonfire! Join us in celebrating the beginning of Summer and the end of a great school year. This is the last event that the 2013-2014 Executive Board will be hosting so please join us for this special event! This will be a pot luck so please feel free to bring a dish or beverages to serve 5 or more people. Bring frisbees, footballs, and other sporting equipment if you'd like. Look forward to seeing you there! If any of you are interested in join SHESS in the American Cancer Society Making Strides Against Breast Cancer walk then please join us this Saturday August 2nd in the City of Whittier . Why am I walking and why do I want you to join me? Well, for one thing, there are more than 2.9 million breast cancer survivors who celebrated another birthday last year because people like you signed up to walk with or donate to people like me. There are a lot of breast cancer events out there, but I’m walking with the American Cancer Society because they are the leader in the fight to end breast cancer. This progress is only possible 1 walker and 1 donation at a time, so please click one of the links at the bottom of this email and join me. Let's finish the fight against breast cancer! Please sign up to walk in this non-competitive, 3- to 5-mile event and raise funds with me. I'd love to see you and thanks so much!